featuring a cherry wood base. Price includes 1 free nameplate. 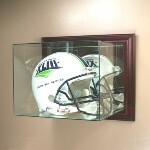 Our wall mount football helmet acrylic display case is beautifully designed and constructed. item you’re displaying. Acrylic is 98% UV rated protection against harmful UV rays. wood bases, real UV protected glass and 3 mirrored back panels. The base is mirrored so you can see the entire helmet. Includes 1 free nameplate. Inside measurements: 14-1/2 x 11 x 11.
mirrored so you can see the entire helmet. 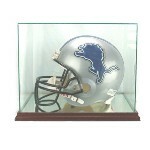 Inside measurements: 14-1/2 x 11 x 11.
traditional metal nameplate/plaque please see Item Code:FOOTBALL-206. entire helmet. Interior dimensions are 14-1/2"L x 11"W x 11"H.
Do you want a custom painted fire fighter helmet? Please visit www.SmokeEaterCustoms.com for more details. frame and real UV protected glass. Includes 1 free nameplate. Interior dimensions are 14 x 12 x 11. Constructed of optically clear, UV protected real glass. with your choice of finishes. 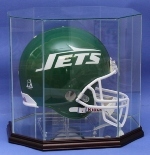 Inside dimensions are: 18"L X 14"W X 10 1/2"H.
Wall mount rectangle - Full Size Football Helmet, Goalie Mask, Baseball Batting Helmet, glass display case featuring a full mirrored back panel, a furniture grade wood frame and real UV protected glass. Interior dimensions are 14 x 12 x 11. Our unique hinged design allows for easy access. Mounting hardware is included. 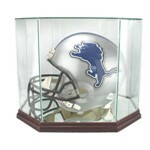 Full size football helmet glass case with moveable custom stand. THIS DISPLAY CASE WILL HOLD A REVOLUTION HELMET. additional panels etched or a traditional engraved nameplate - plaque, please call or email us. You get your choice of 12 custom hand rubbed finishes over solid maple wood. You can even get it with the wood unfinished, ready for you to apply your own finish. The ball sits on our exclusive custom made stand. The pylons hold the ball up off the floor. Interior dimensions are 14-1/2"L x 11"W x 11"H.